When Rinaldo was created, protagonist in London was Nicolò Grimaldi, one of the most celebrated castrati (evirated singers) of the time. When Nicolino (he was wide known with his nickname) came back to his birth town Naples he brought with him Händel’s score, and exactly three hundred years ago, in 1718, the masterwork was performed on 1. October, for the birthday of King Charles VI of Absburg. 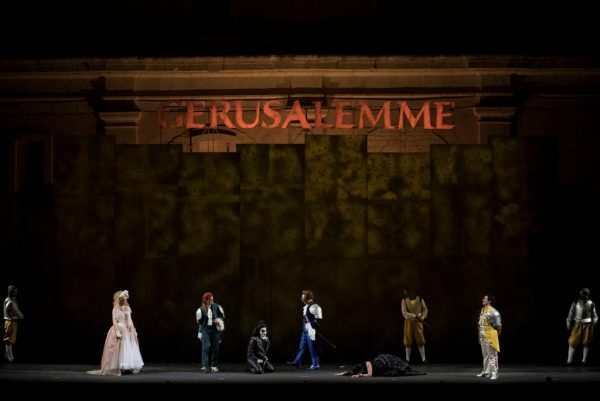 In those times the concept of opera as a “perfect” work of art didn’t exist, as respect to the score “as it had been written” was taken in any consideration: every opera was adapted and also partially rewritten according to the local audience and disposable available singers. So Rinaldo had to be customized according to Neapolitan tastes in musical and theatrical terms. Composer Leonardo Leo added a huge number of new arias, and every singer brought his “aria di baule” (Trunk arias), what means the signature arias they performed on every stage in every opera they performed. 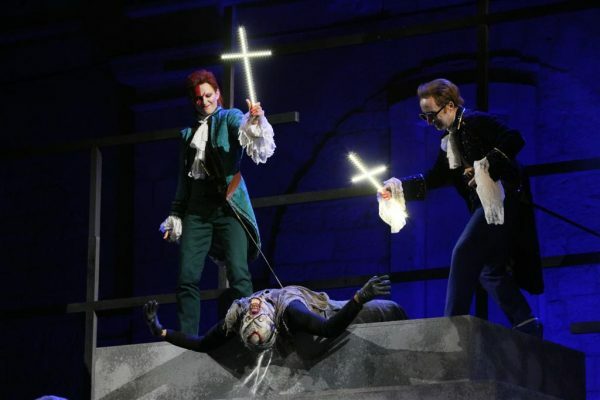 Moreover, two comic characters were added (as usual in Neapolitan operas – they could then take the stage for a short funny Intermezzo in the pause of the opera seria). What was left from this “Pastiche” that was presented to the Naples’ audience? Only the libretto, kept in Naples’ Music school library, interesting but just as curiosity, since the score was completely lost. This was the opinion until 2012, when a copy was surprisingly found in an English mansion. 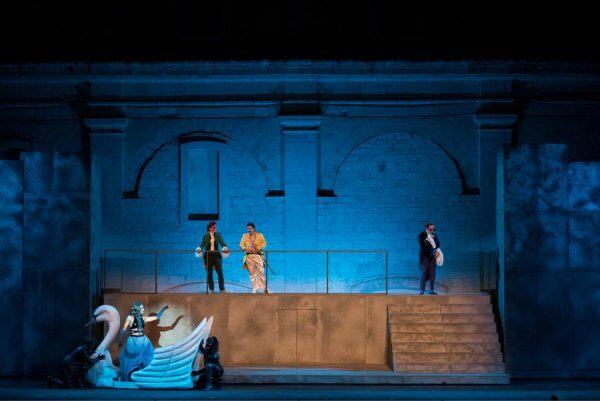 Not complete, however, but working with libretto and new found score, young musicologist Giovanni Andrea Sechi reconstructed the opera as close as it was possible to what people actually saw in Naples. It was longer than the London original, with 39 numbers instead of 32, more focused on the sentimental conflicts, and much less on magical and religious elements. So in Martina Franca all in all we have had an evening of greatest musical interest even if part of the audience had some remarks towards staging and orchestral work. Singers were all first rate and vocally in part with the respective roles, starting with mezzo Teresa Iervolino who gave Rinaldo resolute accents as an hero but taking great care also of the lyrical or mournful moments, typically the most famous aria of the opera Lascia ch’io pianga, originally belonging to Almirena but transferred to the protagonist in the Neapolitan version. Here also the lyrics are changed, the aria becomes Lascia ch’io resti and Iervolino sings it faultless with her alto homogeneous, suitably enlightened as it has been also for another famous aria Cara sposa in first act, while she shows how to keep under control her voice in triumphant tones and agilities in Or la tromba towards the finale. 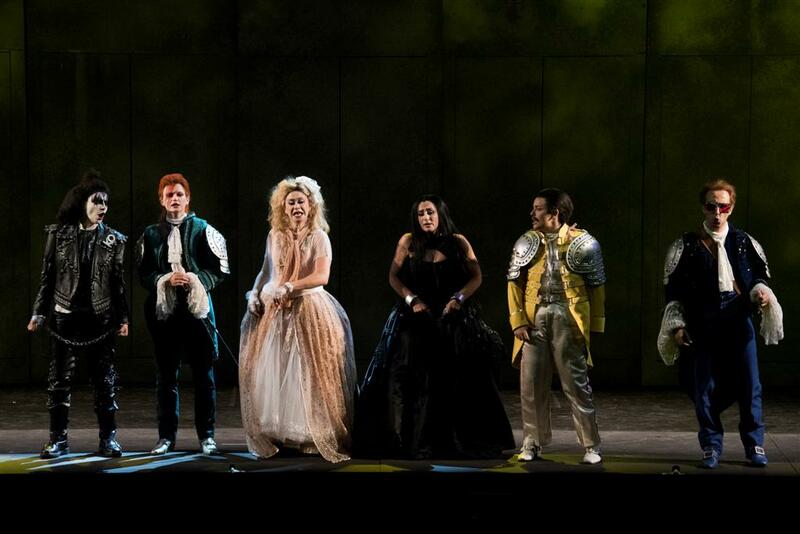 Carmela Remigio gave an outstanding performance as magician Armida, role that in this Naples’ score is deprived of the most audacious coloratura. Remigio sounds imperious and enraged with an impressive stressing of every accent and her soprano firm and strong in temperament. 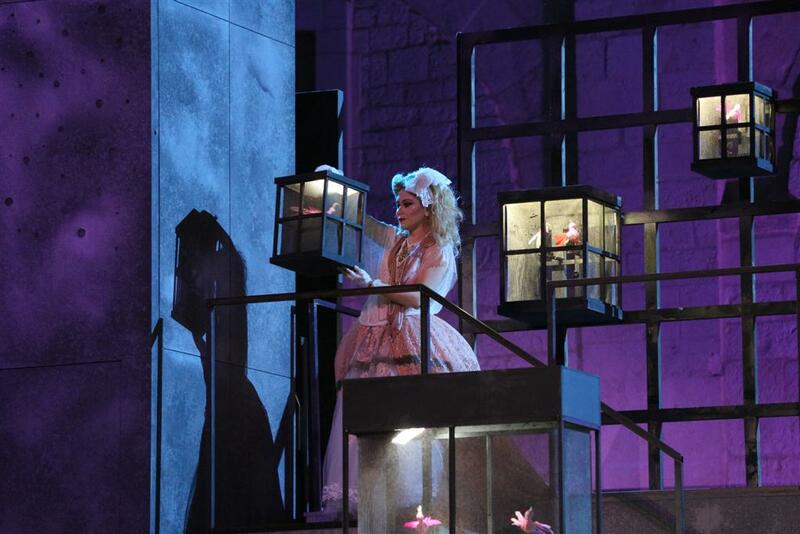 Keeping for herself only two Händel arias but a good three brand new arias written by Leo, her part is maybe among the most reshaped in comparison with the London original. For King Argante no Händel aria is left: the whole part is composed by new numbers. In London the role was held by a bass, in Naples it was an evirate, so in Martina Franca alto Francesca Ascioti took the task with a very fine outcome showing an accurate preparation. With a soft lyrical mezzo and a good sense of legato Loriana Castellano was a charming Almirena. Luckily two arias by Händel are kept for her, included the enchanting Augelletti che cantate that opens act 2, sung flawlessly. Christian King Goffredo was sung by Francisco Fernandez-Rueda whit a clear pleasant voice sometimes not perfectly substained. 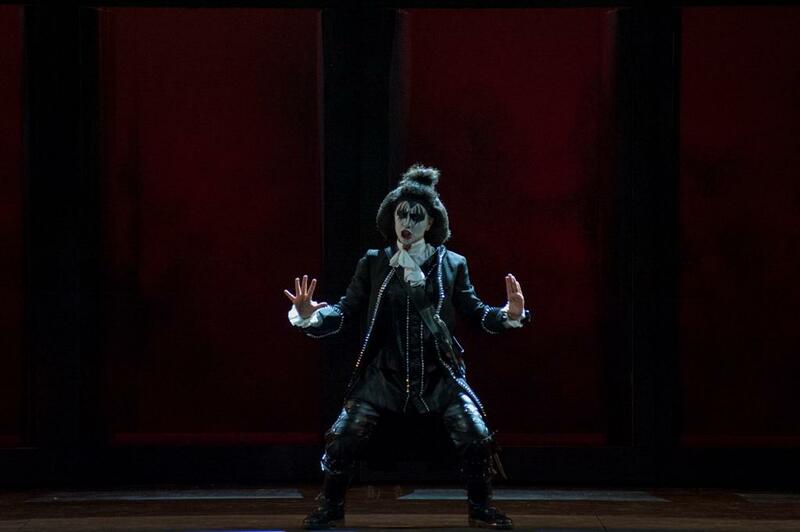 Dara Savinova has been a good Eustazio and for her role as well as for the other minor parts, the reconstruction of the music actually sung in Naples in 1718 has been an intricated work (compliments to Sechi), since no music of these parts is left. 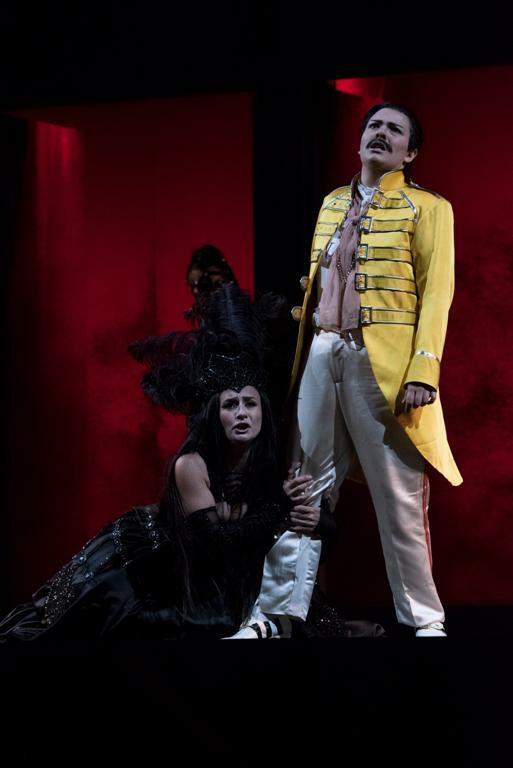 Cast was completed by Kim-Lillian Strebel (Spirit in for of a Woman, attiring Rinaldo in Armida’s realm), Ana Victoria Pitta (Magician Christiano) and Dielli Hoxha (Argante’s Herald). 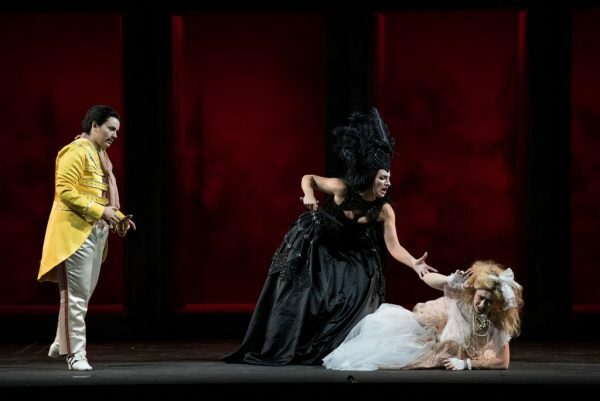 As said, in Naples two comic characters were added to the opera: Lesbina and Nesso, respectively Armida’s and Almirena’s servants. Unexisting in the original version, their music is still completely lost, so they were played here by two actors, Valentina Cardinali and Simone Tangolo, who skilfully gave them a vivacious down-to-earth sense of comicity. Puzzling at first, these spoken parts became then better integrated with the rest of the opera. Orchestra La Scintilla is specialized in baroque repertoire so the musicians were in their field, what was evident listening to their accuracy, harmonization, perfect blending and precision. On podium Fabio Luisi, a world famous conductor, here has been dealing for the first time with a complete baroque score. Maybe too careful in a filed partially new to him, Luisi constrained the orchestra mostly to a monotone pace with low profile sound often lacking in contrast and in colour. Stage director Giorgio Sangati assumed that the original war between Christians and Turks could look like a rivaltry between different rock stars: Turks were represented by dark-rock singers and Christians like pop-rock. 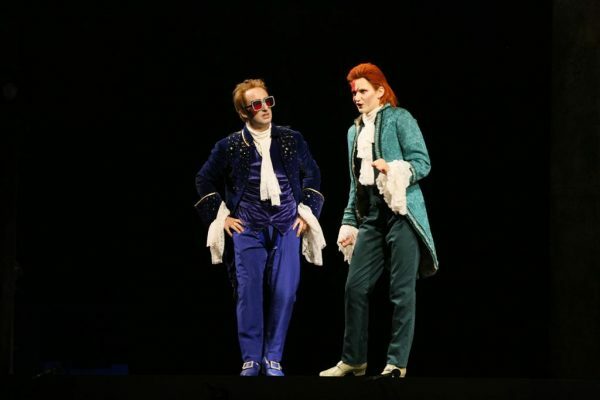 Colourful costumes by Gianluca Sbicca keeped sort of a colourful baroque craziness: Rinaldo and Almirena as perfect copies of late Freddie Mercury and Madonna, and King Goffredo and his brother Eustazio like Elton John and David Bowie. On the other side similarity are with Kiss’ Gene Simmons (King Argante) and Cher (Armida). 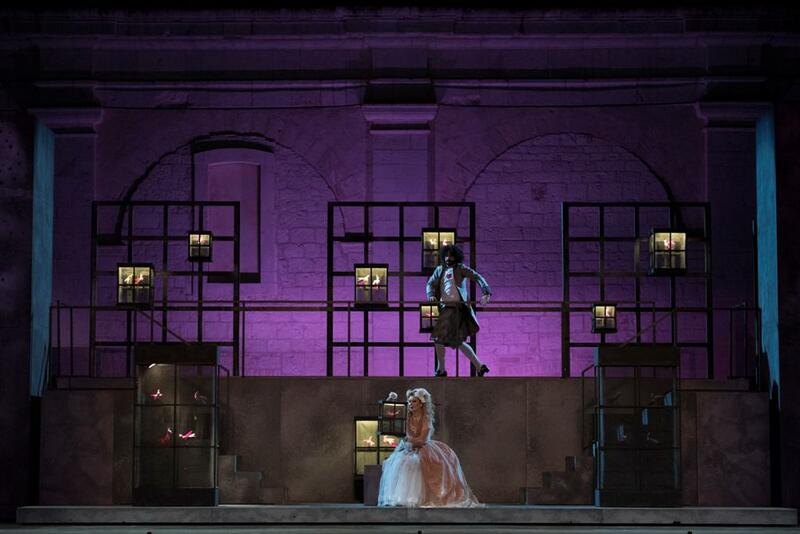 In terms of stage direction, apart the ‘rock’ idea in itself, the action on stage showed a few ideas, and in the whole went on traditionally in terms of gestuality or interaction between the singers, what led such a long opera to the edge of being too uniform: with one intermission, this Rinaldo lasted more than four hours. At the end the audience tributed long warm applause to all the members of the cast with some booing to the stage director.